Akonwick Asked on January 12, 2019 in Business & Finance. I do not see why you cannot trust PayPal. They have been around for a long time and maybe you might have had some frustrations but don’t you have frustrations with your local bank or mobile telecom provider? I work as a freelancer and get my payments in PayPal and pay through PayPal to others who work for me and that without any problem. Just like banks they have financial regulations to follow and if they don’t they have a problem, well at least that is what you hope for. I know that a lot of people are searching for a PayPal Money Adder solution but that should not stop you to use PayPal as a payment gateway both personal as business. There are more payment solutions out there that might be cheaper but trust is a big thing and when the trust is gone I am gone and so far that is not the case. Akonwick Answered on January 12, 2019. PayPal is a favorite tool for sending and receiving money online. It is one of the oldest services available, but whenever you link your financial accounts to an online service, security should be at the top of your mind. So how safe is PayPal? For the most part, it’s safe to use the service and link accounts to PayPal, but it ultimately depends on what your concerns are. Buyers will find that PayPal is an easy and secure way to make purchases. 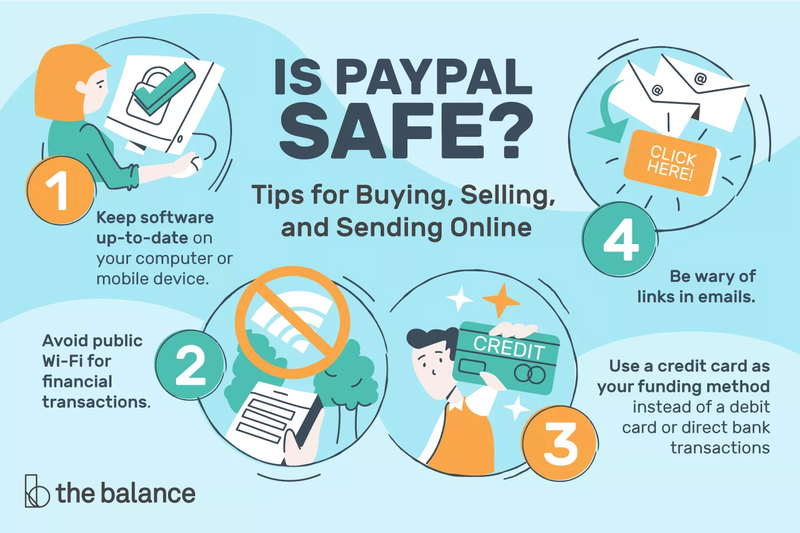 Sellers can also benefit from using PayPal, but there are risks to be aware of. Those risks aren’t unique to PayPal, but some sellers are unaware of potential problems. Money transfers make their way to the destination safely, but the question is whether or not you know who you’re sending money to. Is PayPal Safe for Buyers? For the most part, PayPal is safe when you use it to send money. Nothing is completely risk-free—glitches and data breaches are possible anywhere. But PayPal is a reputable company with enough security and consumer protection in place to keep you relatively safe online. Data security: PayPal’s website is secure and encrypted. As long as you have a secure connection to the legitimate PayPal site, any information you exchange is hidden from prying eyes. PayPal uses industry-standard security features that you’d expect from any large financial institution, and the company even offers financial rewards to “white hat” hackers who discover vulnerabilities. It could get hacked, but it’d be tough. A layer of protection: If you’ve ever used your credit card online or handed a check to a merchant, you’ve taken just as much risk as you take when you provide that information to PayPal. If you didn’t know, thieves can find your bank account and routing numbers on any personal check, and they can (try to) use that information to get money from your checking account. Using PayPal might even be safer than giving your credit card number or bank account information directly to the website you’re buying from. Why? You keep that information in one place—at PayPal—instead of spreading it around everywhere you shop. If something happens, you won’t need to cancel your cards and update all of your automatic billers. You can just secure your PayPal account by changing your password or card number. Take precautions to ensure that your personal and financial information stays safe. Keep software up-to-date on your computer or mobile device—especially security software. Avoid public Wi-Fi for financial transactions, including managing or even viewing your PayPal account. Use mobile data instead if you’re out and about. Use a credit card as your funding method instead of a debit card or direct bank transfer (more on that below). Use a dedicated computer for financial transactions if you want to be especially safe. Don’t use that device for surfing and social media. Be wary of links in emails. Phishing scams may feature messages that appear to come from PayPal but really link to impostor sites that steal your account information. What happens if somebody spends money from your PayPal account without your permission, or if you pay for an item that never arrives? Buyer Protection: PayPal’s Buyer Protection and Account Protection programs might reimburse you. To take advantage, you need to report the transaction quickly, but Buyer Protection does not cover all transactions. Buyer Protection is similar to the benefits you get with a credit card: You can reverse the charges if the seller fails to deliver what was promised. Before you rely on Buyer Protection, read PayPal’s policies to ensure that the service is available for any payment that you’re concerned about. Some transactions are not eligible. Funding method: For extra protection, it’s a good idea to complete PayPal purchases with a credit card (use your card as the funding mechanism—not an “instant transfer” from your bank account, debit card, or PayPal balance). Why? If PayPal decides not to refund your money, you can try disputing the transaction again with your credit card issuer. What’s more, a credit card is not linked directly to your bank account like a debit card, so you won’t have an empty account while you clean up the mess. All that said, paying for purchases with PayPal is likely much safer than paying with Western Union or wiring money—those payments cannot be reversed. Is PayPal Safe for Sellers? You naturally want every transaction to result in mutual gain, but what’s good for buyers isn’t always good for sellers. If you run a business, it’s important to get paid for the products and services you provide. So is it safe to rely on PayPal for processing customer payments? Most businesses that accept payments with PayPal find it to be perfectly safe. They get paid more or less as they expect, and fraud is little more than a rare annoyance. However, there are plenty of horror stories from sellers who feel that PayPal hung them out to dry. There are two sides to every story, but there are enough stories out there that businesses should take notice before assuming that PayPal is safe. Disputed charges: The main risk to sellers is the ease with which customers can dispute charges. Customers can claim that goods never arrived or that you did not deliver what you promised, and PayPal seems to assume that the customer is (almost) always right. You can plead your case, but you’ll need solid proof to get PayPal to decide in your favor. This risk is not unique to PayPal. Customers can also reverse credit card chargeseasily. However, for whatever reason, PayPal seems to have a reputation for being especially difficult to work with. Perhaps that reputation is well-deserved, or perhaps there is just a vocal minority. The payment was genuinely fraudulent (the customer’s account was hacked, for example). A shipment never arrived safely. A customer was dissatisfied with your product. Ship only to verified addresses. Avoid delivering goods in-person. It’s better to have proof of delivery from UPS or a similar shipper if you want PayPal to side with you. Require a signature for expensive items. Clearly explain what you’re selling, including any confusing features or limitations that make customers unhappy. Include photos of any defects or damage. Surprises are not a good thing. Communicate with unhappy customers promptly and politely. In the past, businesses selling intangibles or charging fees for service were immune to Buyer Protection problems. That’s no longer the case. So, be sure to document your communications so that you can provide proof to PayPal if there’s a dispute. Your PayPal balance is typically not FDIC-insured. PayPal has explored ways to offer pass-through protection to customers, but coverage is not broadly available. As a result, if PayPal became insolvent, it’s possible that you’d lose money stored in your PayPal balance. If that concerns you, keep your balance low, and transfer funds to your bank account as soon as possible. PayPal is not a replacement for a fully-functioning bank account. If you can’t qualify for a bank account, other financial products, including some prepaid debit cards, may offer similar features along with FDIC insurance on your savings. UmaimaMalik Answered on January 13, 2019. Paypal is a popular tool for sending and receiving money online. Their online payment service is used by consumers buying on eBay, Amazon and other online marketplaces. PayPal currently has over 100 million active accounts originating from 190 countries. PayPal is available in 202 countries worldwide and supports 25 currencies. People use PayPal to send or receive payments, purchase or sell goods and services, make or accept cash donations, and exchange cash. Whenever you link financial accounts to an online service, security should always be your greatest concern. PayPal is one of the oldest, most reputable payment services company available, and is safe to use. Nothing is completely risk-free being that data breaches and glitches are possible everywhere. Data Security- PayPal has a secure and encrypted website. As long as you have a secure connection to PayPal’s site, any information you exchange is hidden from other users. PayPal has industry standard security measures and even offers financial rewards to anyone who can find vulnerabilities. With any online financial transaction, there are certain precautions to take to ensure safety. Keeping your software up to date on your computer and mobile device will limit risk. Avoid using public wifi when managing or viewing PayPal. If you are out and about it is recommended to use mobile data. Using a credit card versus a debit card will increase safety as well. PayPal also offers a buyer protection program. While it is not guaranteed PayPal will reimburse you, it is important to report transactions quickly. This program allows you to reverse charges if the seller fails to deliver what was promised. There are some different risks associated with sellers using PayPal. Disputed charges are the biggest issue. Customers can easily dispute charges and claim that goods never arrived or that sellers did not provide exactly what was promised. Being that PayPal typically sides with customers, sellers need solid proof to plead their case and have PayPal rule in their favor. In order to limit this risk, it is important for sellers too, the only ship to verified addresses, require signatures for expensive items, clearly explain in product listings what you’re selling accompanied with photos of the product, and communicate with unhappy customers promptly. Akonwick Answered on January 14, 2019.